Combining a complex, expensive stack of technologies to achieve goals. At Triggerfish, its the uncertainty in projects that when tackled correctly uncover magic in any website redesign. When our team is able to respond to business, marketing and technology requirements that constantly change, we can continually measure whether the work at-hand is still valuable. 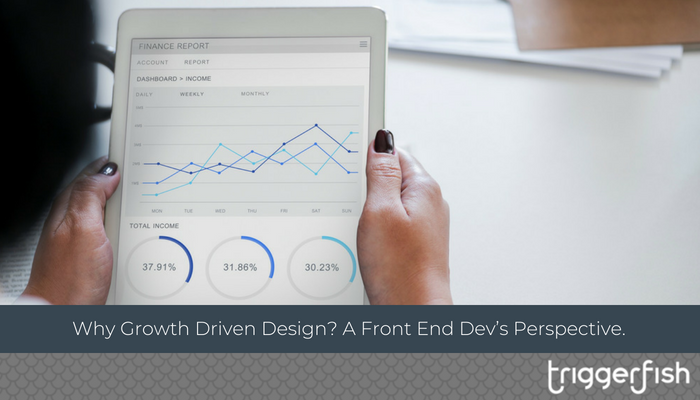 This methodology is called Growth Driven Design and is the core foundation for how Triggerfish delivers our HubSpot and Sitecore web projects. From here on, we'll call it "GDD". GDD, is a process that adopts many of the principles of Agile project management, focusing on delivering smaller working products that directly respond to a primary business goal. As more smaller products are planned, designed and developed, they are monitored and use real data collected from real users to make quantified decisions month to month. From a developers view of the project, GDD quickly responds to sudden changes and new variables that emerge. It also ensures that smaller more manageable deliverables are brought to market, secure in the knowledge that they are bringing tangible value to the business. Strategy empowers not only client consultation but also provides clarify and focus for identifying business goals and the needs of the end users. This guides the design and development process for the end product. The Launch Pad philosophy and deliverable creates a minimal viable product (MVP) for the new website, serving as the foundation for new features and iterations. By starting with a small initial product the development team are immediately collecting live data and gaining insights into user behaviour. Continuous Improvement empowers the design and development team to make informed decisions on next steps, identifying key areas to focus improvements on. This continuing cycle ensures that each new small product being developed is constantly informed by data-driven feedback from the end users. By encouraging a continued cycle of 2-3 month long Build Sprints, themselves separated into smaller fortnightly sprints, the development team can collaborate and deliver small tangible products that slowly expand and grow the Launch Pad website, continually respond to a central business objective. This ensures continued confidence in the product, both for the developers and the client as the results of these products can be observed through live data. The results for a developer include a more tight knit team that is working closely together in concert with the client stakeholders. I personally find this approach means delivering large complex systems by tight deadlines are mitigated. As is the eventual disappointment when those large systems fail to properly bring the desired outcomes. By bringing small incremental products to market, development teams can be confident that they are bringing real tangible value to the business. When change occurs, the team is more ready to adapt and pivot when necessary when creating the next incremental product or making continued improvements to existing ones. By planning out the strategy with a GDD mindset, large complex websites can be developed that better respond to the needs of the client, the stakeholders and most importantly, the end user. At Triggerfish, we have adopted the GDD methodology and philosophy into product delivery strategy. When we work in partnership with clients in planning and implementing products and solutions for the web, we use GDD to empower our decision making throughout the entire life cycle of the project and beyond. To find out more, get in touch with our team today.